The feel of a 70’s home, F&B is a surprising story about a straight-laced nerdy kid who signs a “Partnership for a Drug Free America” contract. One night 35 years later, in a Hollywood club, that late bloomer is given an MDMA. It’s a story of control, propaganda, fear, friendship, and change. Pea Harrison – an extremely sensitive and strong actor/writer, who possesses an emotional depth that is hard to come by. As a conservatory trained actor, her story telling, use of American Sign Language, and the melodies that come from her voice during F&B will surprise. 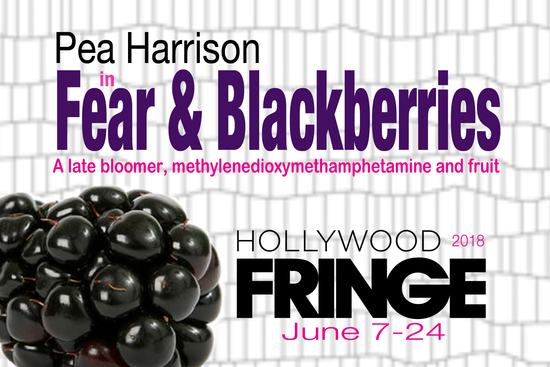 Fear & Blackberries is her first Solo Show, and is also an alternate in the 2018 Los Angeles Women’s Festival. A sweet concise 30 min show, not to be missed!